The Phenomena of Stranger Things! One if the best parts of binging a show on Netflix, Hulu, or Amazon Prime, is getting so invested in the show, invested in the characters, and really falling in love with the show. Netflix is smart to do this, especially with their Netflix original shows. We here at The Group Real Estate, in Idaho Falls, love talking about our favorite shows to binge watch. As we look for shows to watch on Netflix, Hulu or Amazon Prime, we love discussing some of our favorites, why we binge watch, why we are attracted watching the same shows over and over, etc. There are so many to pick and choose from, as you search each one of these platform. Especially, now that all of these platforms have started doing their own original shows. As I love some of the amazing shows on all these platform, here are a few that I love to watch, over and over, and I did binge. Now Netflix is great, as it puts out every episode of the season right as soon as it is released. Daredevil was one I was very excited about. The comic book nerd in me, knowing it was going to take a more mature route than the movies were going, and that it was on a “smaller” scale. I took one weekend to binge this, then Jessica Jones, followed by Daredevil season 2. The shows were amazing, and I loved watching every minute of them. However, shortly thereafter, I saw a small trailer for a soon to be Netflix original coming out that was to be called Stranger Things. The promos talked about it being an homage to the 80s movies that I loved growing up, the horror feel of X-Files and 80s films, plus a feel of what we loved from John Carpenter’s movies and soundtracks. All of these things were very much bringing me in. After it came out, a friend of mine watched it, loved it and he told me all about it. A great story line, the character work by the kids (giving us a great ET or Stand By Me feel), and the wonderful horror elements with the 80s synth soundtrack. This show was something I needed to watch. As a kid of the 80s and 90s, I loved all of these things. A product of pure nostalgia, like a lot of kids in that era were, and still are. That is why a show such as Stranger Things hits the perfect spot for people. So, I decided I needed to get going with Stranger Things. I decided I was going to start it while I was doing some post workout cardio. As I started into it, it was perfect. The setting was wonderful, it was frightfully scary, and the kids were absolutely exceptional together. The story tells us about a young boy, in a group of kids, named Will, who is taken by a creature. One that looks like the nightmarish stuff I grew up with from X-Files. Now, to set this up, I will let you know that one of the scares at the beginning made me throw my phone from the treadmill, as I was holding it, to change the volume, when the moment happened. Thus ensues the mother of Will and his friends doing everything they can to find him. As we meet the Detective who is in on the missing report, he is the only one who believes that something Strange is happening and it goes full science fiction, especially when we are introduced to one of the greatest characters of all time, Eleven. A young girl, played masterfully by Millie Bobby Brown. With telekentic type powers, this upped the science fiction even more. 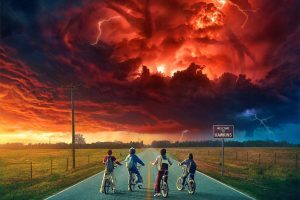 Not only is this a great story for science fiction lovers, with alien monsters from a place called the Upside Down, a telekinetic girl, and mom fighting for her son’s life, but this is a show that embodies everything people love about TV shows. There is wonderful amounts of humor, there is a great story of camaraderie in friendship, great amounts of true horror and a soundtrack to die for! As we approach this weekend, Stranger Things season 2 is coming to Netflix. This is the perfect time to go back and binge Stranger Things again. Getting back to the show is something most, if not all, fans will likely do getting ready for season 2 to start. 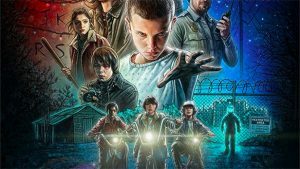 This is common with a lot of Netflix shows to do, but where Stranger Things sets itself a part, is being the best TV show that Netflix has put together. What makes it amazing, is it appeals to all types. Every genre is hit perfectly in this TV show. I love the Marvel shows, I truly do. But I can see how they wouldn’t appeal to the masses, per se. Though great, and ripe, with all these same things, there is one thing missing: they just aren’t Strange enough.